What is Regimes and what are your roles in this project? REGIMES is a 3-year research project funded by the Research Council of Norway that integrates political and social science with ecology and economics. A main objective of the project is to understand complex future scenarios of the Svalbard archipelago under climate change. As Project Leader, I am the project leader, and responsible for the overall project management, but I also use my competencies in fisheries management and transdisciplinary research for the work that integrates bio-geo-chemical model results with social, ecological and economic theory and objectives. The overall goal of the REGIMES project is to engage a diverse group of academics with diverse groups of stakeholders in these plausible future scenarios to build a capacity of responsiveness for Norway to adapt to climate change. The specific case we focus on is the archipelago of Svalbard in the Arctic, that is under the Kingdom of Norway as its sovereign but that falls under the Svalbard Treaty where all signatories have equal rights still, which complicates things, especially with climate change and the stressors this results in on the local community and the marine area and associated recourses therein. What were your project team´s impressions about the social capital of the population of Svalbard, especially under climate change? The main impression on the social capital of the local community of Longyearbyen specifically centered around the fact that this town of about 2000 people has a very transient population: people coming and going for shorter periods of time, making it a town where the collective memories are not as strong as in more stable communities. Another strong impression is how international the community of Longyearbyen is, so much so that there are many “sub-communities” of people of common nationalities. One of these communities that impressed me most was the Thai community, which may be surprising to some. Many Thai citizens reside and work in Longyearbyen and Thais are the fastest growing nationality group in Svalbard. One of the reasons for this seems to be that many Thai people are looking for well-paid work and because of the Svalbard Treaty, are free to come to Svalbard without a work permit (as per the law set up with signatories of the Treaty) as long as they have a job. Besides the Thai community, I personally have a strong impression of what it would be to have a family in Longyearbyen. When we conducted our fieldwork in Longyearbyen in August 2017 I was over 6 months pregnant with my third child. 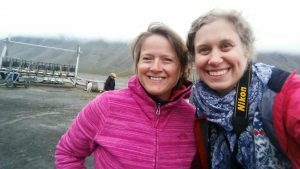 We learned during this fieldwork and study trip that no one is allowed to give birth in Svalbard. This is due to the lack of full social and medical services in the archipelago. As a consequence of getting pregnant, you must leave your family (if they are not able to travel with you) at around 8 months of gestation to give birth in Tromsø, Norway, the closest city to Longyearbyen on the mainland. I myself could not imagine the thought of being in a place where pregnancies are treated as a risk to society, not to mention having to leave my family to build my family. I personally was glad I had a birth plan in Bergen, where we live, and wasn’t forced by the government to plan a birth in a city and hospital far away. During our interviews with the local population, we furthermore learned more about their fears for climate change induced environmental challenges, specifically related to avalanches. The vulnerability of having a lack of collective memory was also something that many of the interviewees brought up as well, and many also commented on how raw it felt when people just kept moving and you were unable or unwilling to go into deep relationships with people when you knew they would soon move away. What are the main challenges going forward for the community of Longyearbyen? In addition to being personally vulnerable, job security is something else that is challenging for the future of this High North Arctic community. Earlier in 2018, Norway decided to stop coal mining in Svalbard, a watershed decision that now puts the most significant business sector for the development of Svalbard in the 20th century firmly in the past. A big challenge for Longyearbyen is how to maintain a strong community without coal and at the same time in face of a warming climate. Literally, the foundations of the infrastructure of the community are softening due to the permafrost thawing which renders structures and buildings unstable. In addition, the avalanche situation has made once safe spaces now lethal areas. One of the newer neighborhoods built in Longyearbyen has recently been declared too unsafe (after several avalanches, some without warnings, and two people dead) and the apartments and houses are all being destroyed and rebuilt in a place deemed safer. Underlying all these challenges is the local governance challenge of having to adapt to new climate scenarios while at the same time planning for a sustainable and robust future for businesses, the environment and the diverse Longyearbyen community. How will climate change affect the marine areas around this island community? We hope that our REGIMES project is able to shed light on future sustainable scenarios of the climate-environment-society-geopolitical nexus to make a sustainable future more tangible in the options for the decisions that have to be deliberated now. This is especially important with fish species changing their distribution patterns northwards under warming waters, whereby fish that were previously never caught in the marine zones around Svalbard now are – and more are expected should the status quo of increasing sea surface temperatures continue. This ties into not only geopolitics, with fishers following the fish northwards, but also into how this community can adapt to being coal free with potentially being able to start up a landing site – or even being a hub for ships that in the future are able to use the ice free Arctic ocean to transport goods over large distances. To learn more about the regimes project, see www.regimes.no. Dorothy J. Dankel (b. 1979, USA) is a researcher at the Department of Biological Sciences at the University of Bergen (UiB). She holds a PhD at UiB in Fisheries Management (2009) and has spent her research at the School of Marine Science and Technology at the University of Massachusetts (USA), the International Institute of Applied Systems Analysis (Austria) and the Centre for the Study of the Sciences and the Humanities UiB. Dankel is one who “researches research” and uses theories and methods from both humanistic and social subjects to analyze accountability and sustainability in marine research, climate change and biotechnology.